Less than a week before President Obama gives his State of the Union address, the president’s job approval rating is mixed: 46 percent approve, and about the same percentage, 47 percent, disapprove. Over the past year, his approval rating has mostly hovered in the mid 40s and has not hit the 50 percent mark since February of last year. His 46 percent approval is up four points from December (42 percent) and up from his all-time low of 37 percent in November. As the president begins his sixth year in office, his approval rating is slightly higher than that of George W. Bush at a similar point in his presidency (42 percent approval in January 2006), but lower than the ratings of both Bill Clinton (56 percent in January 1998) and Ronald Reagan (65 percent in January 1986). More Americans disapprove than approve of the president’s handling of many of the specific issues measured in the poll. Approval is especially low on the president’s handling of the budget deficit (35 percent approve) and the surveillance activities by the National Security Agency (34 percent approve). The president’s favorability rating is lower now compared to a year ago, just after his re-election. Forty-two percent now have a favorable opinion of him, down from 50 percent last February. Almost as many (40 percent) view Mr. Obama unfavorably. Looking ahead to the next two years, few Americans (13 percent) think there will be more cooperation between congressional Republicans and the president. More than half expect the level of cooperation to be the same as it was in the past, while a third expects less cooperation between the two sides. Just after ending an unproductive year, Congress continues to receive very low marks from Americans – just 11 percent approve of the job it is doing, and 82 percent disapprove. By a large margin, more continue to think the country is headed on the wrong track than in the right direction. Views of the economy remain about where they have been for more than a year: just over a third rates the economy good, while far more (61 percent) say it is bad. The economy remains the nation’s top priority, and just under a third think overall it is improving; a quarter think it is getting worse. Those views have also remained fairly consistent over the past year. And 64 percent say they are at least somewhat concerned they or someone in their household might be out of work and looking for a job in the next year, also mostly unchanged. But there is some positive economic news in this poll: 41 percent of Americans think the housing market is improving and three in 10 see improvement in the stock market. On the job market, however, more think it is getting worse (33 percent), than getting better (24 percent). Legislation has been proposed to extend unemployment benefits and to increase the federal minimum wage. Majorities support both these measures, but some raise concerns. Sixty-five percent think unemployment benefits should be extended to those who are currently out of work, but there are stark partisan differences. Democrats and independents support extending benefits, while Republicans are opposed. Though 42 percent of Americans think receiving unemployment benefits makes people less motivated to look for a job, almost as many - 37 percent - say it makes no difference, and another 17 percent say it makes people more motivated. There is also strong public support for raising the federal minimum wage from $7.25 to $10.10 an hour; more than seven in 10 Americans favor it. Large majorities of Democrats and independents favor a hike in the minimum wage, while Republicans are split. More than half of Americans (54 percent) don’t think raising the federal minimum wage would reduce the number of jobs available, but four in 10 think it will. Two government programs continue to be held in high regard by the public: Medicare and Social Security. Most Americans, including majorities across the political spectrum, say these programs are worth the cost for taxpayers. Democrats are most likely to think these programs are worth the costs (75 percent say so for Medicare and 80 percent for Social Security). Among Republicans, 64 percent say Medicare is worth the cost for taxpayers, while 67 percent say that about Social Security. As Washington debates how best to address income inequality and economic mobility, Americans view the policies of each party differently. The policies of the Republicans in Congress are seen by most (63 percent) as catering to the rich. 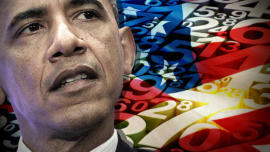 The public is divided as to who the Obama administration’s policies favor. Both sides often pledge to help the middle class, but few Americans think the policies of either side do so. Health care ranks second on Americans’ list of problems facing the nation, and more disapprove than approve of the Affordable Care Act – this has been the case since the law was passed. While few (6 percent) say the law is working well and should be kept as it is, the percentage that calls for repealing it has dropped since last November, from 43 percent to 34 percent now. And the percentage of Americans who say signup on the health care exchanges is going well has steadily increased since last October, when the web site was launched. Still, just 22 percent say it is going well, and more than twice as many (53 percent) say it is not going well. In November, a month after it launched, only 11 percent said signup was going well. About a third says signup is improving. Fifty-four percent of Americans would like illegal immigrants to be allowed to stay in the U.S. and eventually apply for citizenship. Just 12 percent would like to see them allowed to stay legally but not apply for citizenship. Thirty-one percent, including 46 percent of Republicans, think they should be required to leave the country. The topic of income inequality has become a focus of public debate. This poll finds that seven in 10 Americans think the gap between the rich and poor in the U.S. is getting larger. This view cuts across party lines, income levels, and social class. However, Americans are more divided on whether the government has a role in reducing this income gap. Democrats (68 percent) and independents (50 percent) think the government should do more, while most Republicans disagree (75 percent). Fewer than half of Americans now think their chances to succeed in life are better than their parents’ generation, and they express even more concern about the future of the next generation. Forty-four percent say their opportunities to succeed are better than their parents’ generation, down considerably from 2000 and 2007 and the lowest percentage in CBS News Polls. Thirty-five percent now think their opportunities are worse than their parents’ generation. Those with lower household incomes are less likely to say their prospects of success are better than their parents’ generation. The public is even more pessimistic about the next generation’s opportunities. More than half (53 percent) think the future for the next generation of Americans will be worse compared to life today – the highest percentage in nearly 20 years. Nevertheless, a slim majority still has faith in a keystone of the American Dream: 52 percent think that even in today’s economy, everyone still has a fair chance to get ahead in the long run. That is far more than felt that way in 2010, when the economy was in worse shape than it is now and the unemployment rate was above nine percent. Forty-three percent think only those at the top can get ahead, but that is down from 62 percent in 2010. Republicans (73 percent) are more likely to think anyone has a chance to get ahead, while fewer Democrats (45 percent) and independents (45 percent) think that. Nearly two in three Americans believe that money and wealth in the U.S. should be more evenly distributed; just three in 10 think it is fairly distributed. Republicans disagree with Democrats and independents on this. Also, Americans with lower household incomes are less likely than those earning more to say money and wealth in the U.S. is fairly distributed. Americans also perceive unfairness in the tax system. Half say they pay their fair share in federal income taxes, but almost as many feel they pay more than their fair share. At the same time, most think upper income Americans pay less than their fair share. This poll was conducted by telephone January 17-21, 2014 among 1,018 adults nationwide. Data collection was conducted on behalf of CBS News by Social Science Research Solutions of Media, Pa. Phone numbers were dialed from samples of both standard land-line and cell phones. The error due to sampling for results based on the entire sample could be plus or minus three percentage points. The error for subgroups may be higher. Interviews were conducted in English and Spanish. This poll release conforms to the Standards of Disclosure of the National Council on Public Polls.